In 1884, Isaac Friend came to Lincoln, Nebraska to make his home and engage in business. He found no organization of any kind to represent its few Jewish residents. Friend gathered together a few of the town Jewish residents to form Congregation B’nai Jeshurun in the fall of 1884. In addition to Friend, the founders were: Aaron Katzenstein, Isaac Oppenheimer, Moses Oppenheimer, and Leopold Barr. When Lincoln was chosen as Nebraska’s State Capital and the legislature met for the first time in early 1885, one of it first decisions was to set aside city lots for religions of all denominations. For $50, Congregation B’nai Jeshurun obtained a provisional deed for two lots on the northwest corner of 12th and D Streets. However, lack of finances held back construction until 1893, when the membership of 28 determined that a formal synagogue would give them both a place to worship as well as a building to attract Jews from the surrounding area. A meeting was called. $2,200 was subscribed to by the members, and each was charged with securing donations from others. An additional $4,500 was collected from citizens and businesses. The Building Committee consisted of M. Weil, President; M. A. Newmark, Vice President, Somon D. Mayer, Henry Schlesinger, Isaac Friend, and Morris Friend, Trustees. Congregation B’nai Jeshuran was built and dedicated on Rosh Hashanah Eve of 1893. Rabbi David Marx, a senior student at Hebrew Union College (HUC), was engaged to conduct the High Holy Day services. Rabbi Leo M. Franklin of Omaha helped conduct the dedicatory services. Shortly after the dedication of B’nai Jeshurun came the financial Panic of 1893. Instead of increasing, membership fell. Rabbi Franklin agreed to serve part-time as acting rabbi until the congregation was able to hire a perminant religious leader. For the next 11 years, various student rabbis from HUC served B’nai Jeshurun. In 1912, Rabbi Jacob Singer was hired as the congregation’s first full-time leader. Rabbi Singer formed a junior congregation, and a pipe organ was installed, a gift of the Jewish Ladies’ Aid Society. In 1922, a fire destroyed most of the synagogue. The congregation purchased a new site on the corner of 20th and South Streets. A synagogue building was dedicated in 1926 and is still in active service. Of special note is the dome of the new synagogue, designed by Professor Meyer Gaba, a member of the congregation. Its unique design allows the speaker from the pulpit to talk in a normal voice, without amplification. 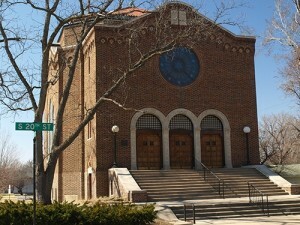 Today, Congregation B’nai Jeshurun is known affectionately by Lincoln citizens as the State Street Synagogue. Maurice A. Newmark, “Beginnings of the Pioneer Congregation of Lincoln,” Western States Jewish Historical Quarterly 14/1.